Call 1-800-232-9542 for reservations. SheRide Snowboard Camp starts the early morning of February 23. We recommend you book your stay from February 22-28. We recommend that you stay at the resort for ease and convenience. Book EARLY to reserve your stay at Snowbird as lodging does fill up. *SheRide Snowboard Camp does not include lodging. Call Canyon Transportation 1-800-232-9542 to reserve a ride to or from the airport. Please pick up your gear (snowboard, helmet, boots) before arriving at SheRide Snowboard Camp on February 24. If you can’t make it to SheRide Snowboard Camp but still want to ride with the ladies there are options. Book a Private Lesson at Snowbird Resort with Gwenie Flickinger or Sandra Guzman. 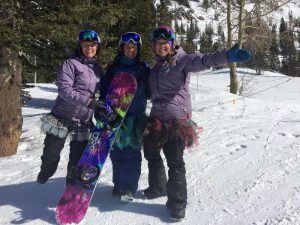 These ladies are professional snowboard instructors at Snowbird Resort in Salt Lake City, UT. For Private Lessons at Snowbird Resort call 1-801-947-8222. SheRide Snowboard Camp may be canceled but SheRide Snowboard Camp does not offer refunds. We recommend buying vacation insurance if you are concerned about your ability to attend or complete camp. We will allow you attend another camp in the season for a charge of $250. Copyright © 2019 SheRide Snowboard Camp. Powered by WordPress. Theme: Spacious by ThemeGrill.